1. If the student cancels within 5 calendar days after midnight of the day the student signs the Enrollment Agreement (FULL REFUND PERIOD), the student will receive a full refund with no further obligation. 3. Any student who fails to complete a lesson within 60 days of enrollment or any 60 day period after enrollment will be automatically withdrawn from CIE and obligated for a registration fee and percentage of tuition as shown above in Paragraph two. CIE may charge for any unused equipment and/or unserviced lessons. 1. Your enrollment represents an investment in education. Your lessons will be sent to you when you need them as you progress through your course. 2. CIE will pay surface shipping costs for lesson material to students located in the Continental U.S. Shipping costs for program-related equipment or software and any customs duties levied on such equipment or software will be paid by the student. The cost of air shipments when requested by the student must be prepaid by the student. 3. If you elect to pay all or part of your tuition on a monthly basis, all payments must be made when due, regardless of your rate of study progress. In the event a regularly scheduled monthly payment is not received at the school on the date on which it is due, a late charge of $15/month (Career Course) will be assessed for each such late payment. A $30.00 charge will be added to your account every time a check is returned for insufficient funds. Delinquent accounts will be sent to a collection agency. You agree to reimburse CIE the fees of any collection agency, which may be based on a percentage at a maximum 30% of the debt, and all costs and expenses, including reasonable attorney's fees, we incur in such collection efforts. This contract is void after course time limits have been reached. See catalog for course time limits or visit www.cie-wc.edu. 4. Full tuition payment entitles you to educational materials and service subject to #1 (Student Rights and Obligations) for the Completion Time Allowed and during any authorized Course Extension. Students who enroll in courses 2, 2C, 3, 3C, 4, 4C, 5, 5B, 6, 6C, 7C or 14B are responsible for purchasing a limited number of textbooks that are not included in tuition. Visit www.cie-wc.edu/textbook_prices.aspx for current textbook prices. 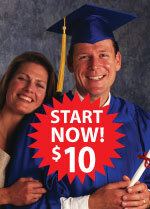 If a 3 month extension to any Career Course is granted, a $100 Extension Fee will be applied. Other student rights, including the right to cancel your enrollment, cease upon expiration of the Completion Time Allowed for your course. 5. Upon successful completion of all academic and financial requirements for Courses 1B-14B, you will be awarded a Certificate or Diploma. 6. CIE reserves the right to make revisions in program curricula leading to increased educational value to the student. 7. Ten percent or $250 (whichever is less) of your total tuition needs to be paid in order to receive the initial lab equipment. 8. If applicant is under 18 years of age, the parent or guardian must sign the application as financial sponsor, and such signature shall bind such person to all the terms upon acceptance by the school. 9. Standards of Academic Progress: In order for a student to meet any and all obligations, it's recommended that a minimum of 1 lesson be completed per week. 10. You are entitled to the tuition as stated at the time of enrollment through graduation. Should your enrollment be terminated for 60 days or longer, upon re-enrollment you may be charged the cost of the current tuition. If a student has a problem or complaint, the student may register the problem or complaint with the President of CIE. In addition, the student can register the complaint with the State Board of Career Colleges and Schools, 30 East Broad Street, 24th Floor, Suite 2481, Columbus, Ohio 43215 Toll Free: (877) 275-4219 or local (614) 466-2752. The first monthly payment will be due 30 days after your enrollment is received at CIE. Subsequent installments will be due the same day of each month thereafter until the full tuition is paid. You have the right to pay off in advance the full amount due and receive a partial refund of the finance charge. Do not send cash through the mail. Please use a personal check, money order, PayPal or credit card payable only to CIE Inc. The following statement is required by the Federal Trade Commission.